Just wanted to say thank you so much for helping me find the perfect dress, I felt so special on the day, it was perfect! Just a quick note to say thanks so much for putting up with me. You managed to ‘sort’ a dress (after a few tweaks and alterations along the way) I loved and felt fantastic in for my wedding day. To leave David speechless is quite an achievement! I’ve attached a couple of photos for your website etc. Thank you so much for the excellent service you provided when I was buying my wedding dress. Here is a photo of Andrew and I. Thank you so much for my beautiful dress I have attached some photos as thought you might like to see how everything turned out!! Dexter looked very dapper. Also we’ve just bought two cocker spaniel puppies so they’re in there too! Meet Mable and Merlin. I thought you may appreciate a couple of pictures from our wedding. My dress was the most amazing dress in the whole entire world and I just want to thank you both for looking after me and getting my perfect dress. If I could buy a wedding dress for every weekend I’d buy it from you. I’m going to miss popping in to see you both. Just to say a huge thank you for all your help and advice. My dress looked absolutely stunning and everyone commented how beautiful it was. The secret sparkle layer looked fabulous both during the day in the sunlight and at the evening reception. You made me feel totally relaxed and at ease when trying dresses to find the perfect one and at both my fittings. I’ve attached some of our official photos for you. Hope you like them. We had a fabulous day and I truly felt amazing in my dress! Thank you! Some pics below! I hope you are all well. I have attached below a link to our wedding photos so you can see how the dresses looked. Elizabeth and I absolutely loved them (and of course Nick!). 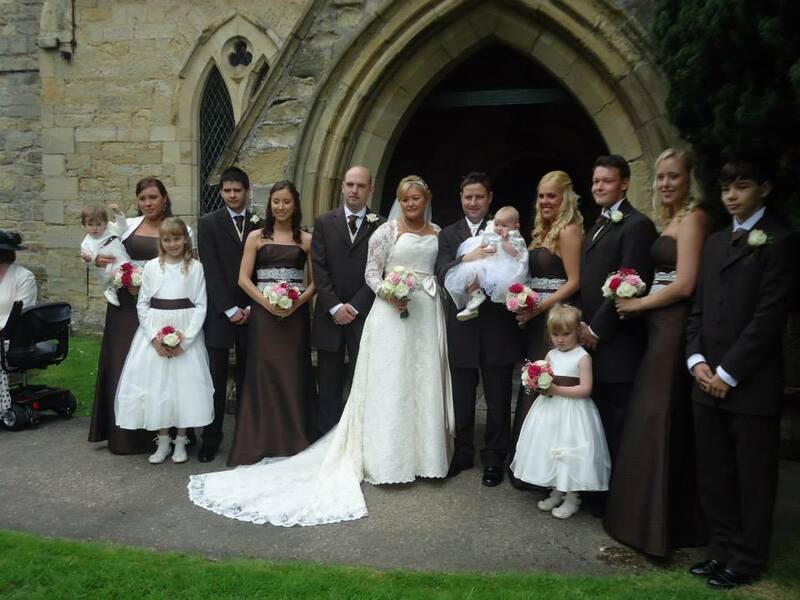 They were perfect for the day, fitted really well and we got lots of complements. Thank you again for my beautiful wedding dress and all of your help. Thank you for everything you did for me in making our day so special and helping me find my perfect dress and bridesmaid dresses. A few photos attached. The rest will be on Emma’s website soon under password 13052017. Please feel free to have a look. I am now back from Honeymoon on Mull and getting used to life as Mrs Travis! We had a wonderful wedding day and reception, and everyone has been so complimentary about the dress – and especially how it sparkled! I loved the overall look and thanks again for also helping me to choose the right shoes! I am only able to send on a couple of photos sent by friends so far, however I can forward on an official photo or two once we can download these. You will see that I had a surprise visitor on the day – my Icelandic horse, all dressed up in my football team’s colours! I cannot thank you enough for making the whole dress experience such a pleasurable one- especially as I was unsure from the outset whether I wanted to look like a bride! I hope you have had a good Easter and when I am in Northallerton again, I will pop my head round your door to say “hello” if you are free! Thank you so much for all that you did do me. You made finding a Wedding Gown easy and stress free with all your help and guidance. It’s safe to say the dress didn’t disappoint on the day! It was stunning and so many people commented on how unusual but beautiful it was! Here are some photos. Feel free to use any of them. I have also attached some so you can see my hair properly. (After doing it myself, it turned out better than I thought)! Thank you again for all your help. It was wonderful to meet you. Hope you received my Thank You card! Thank you so much for your help and professionalism in helping me choose the perfect dress for me. I’m so glad I rang your shop last year to enquirer about that style of dress and fell in love with it instantly. I can’t thank you enough. I hope you like the pictures. Just remembered you asked for a photo! Sorry it has taken so long! We had the most amazing day, and I just loved my dress, thank you so much. As you can see it was a gorgeous sunny day, not bad for December! I’ll have to be wearing my dress again before too long-it’s just lovely for it to stay in the wardrobe!! Hope your well, im just emailing to say a huge thank you for all help, support and amazing advice when choosing and ordering the perfect bridal gown for me. We are sending out thank you cards however we are still awaiting on our photographer with all of our photos of which will be part of the thank you card. Ive attached some of our photos from our shoot in paris whilst we were on honey moon, im sure youll agree the dress and veil look fantastic and you can really see it in the photos. Ive never felt so welcomed and at ease when trying on (the numerous amount of times) in your bridal shop, after trying on 36 dresses i now think why didnt we come to you first it would have been so much easier. Your amazing at what you do, i felt incredible on my wedding day and have had nothing but compliments about my dress and veil and if i do say so myself it did look absolutely stunningly beautiful, all thanks to you. I love my dress – it was a perfect fit and looked just as I’d imagined it would on my wedding day. I had so many comments about it on my wedding day and it looks fantastic in all my photos. 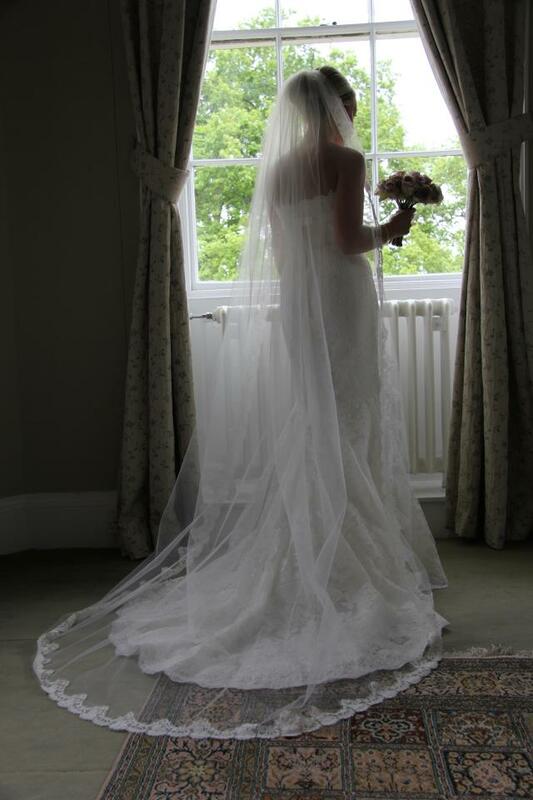 From the minute I chose it the Bridal lounge were so helpful allowing me lots of fittings and providing lots of guidance to ensure it was perfect for me. I would definetly recommend you to any of my friends. Just to say thank you, we had the best wedding day ever. Here’s a couple of pictures I thought you might like to see of ‘the dress’ on the day! Sorry it’s taken a while to send these – we went away on honeymoon just after we had popped into the shop. Here are a few pics from our wedding. Thanks again for everything you did to give me a beautiful wedding dress. Thanks for getting in touch, not sure what’s going on with emails but never mind! Here are some photos (so hard to pick just one!) we had a fantastic day, can’t believe it’s been a week! Got back this morning from our honeymoon road trip, been to some lovely places in the UK! About a stone heavier now but had a good time! Hi Charlotte just thought you might like to see theses. Thank you for everything the dresses were perfect. Here you go sorry they took so long, a bit of a selection below. I absolutely loved the dress was exactly how i wanted it, thank you for all your help! Sorry it’s been so long to get these photos to you! It’s been a whirlwind the last 7 months but thought I would send you some photos as promised of our special day and of my dress that you were so fabulous with getting it perfect for me! I thought I would send you a couple of photos of our wedding on 21st May at Malcesine in Italy. Everyone loved my dress and the day was wonderful. Thanks for your help and patience in getting my dress ready for the big occasion – I’ve sent you some photos of how it looked on the day. Still waiting for the official photos, but thank you again. I just wanted to say a huge thank you for helping me choose my gorgeous dress. I was really struggling to make any decision before I went to your Northallerton branch but as soon as my mum burst in to tears I knew it was ‘the one’. My bridesmaids also really loved their dresses and they looked so beautiful on the day. A massive thank you to all the girls who helped us all with our fittings too. You all made everything nice and easy and stress free which was amazing. I’ve attached a few photos to see how everything looked on the day. I have a few friends getting married over the next few years and will certainly be recommending they visit you. Thank you so much for helping me choose the perfect wedding dress. We had a lovely day – it poured down in the morning but then brightened up. Stumbling across The Bridal Lounge was one of the best things I could have hoped for whilst searching for my dream wedding dress. The whole team were absolutely brilliant, and were exceptionally helpful, professional and passionate. I couldn’t have asked for more love and attention to be spent on the dress alterations to ensure my dress fitted me perfectly, which made the whole experience so enjoyable and completely stress-free. I absolutely loved my stunning dress – it made me feel so beautiful and I received so many compliments, especially from my new husband! I would highly recommend The Bridal Lounge to any brides-to-be. Thank you again for all your help with my gorgeous wedding dress! I felt fabulous and we had a wonderful day. I just wanted to say a huge thank you for your help and support in getting me ready for the big day. I was really happy with the dress; I felt so comfortable in it – it just felt right. And the best compliment was a French girlfriend who told me that she’d never seen a dress so perfectly suited to a Bride… as you know, that means A LOT coming from a French woman! I’m attaching a few pics in case of interest. We haven’t yet had the professional photos through, but hopefully these at least give an idea of how everything looked. Thanks too to Helen and the whole team at Brides of York – you were all amazing! Hope to see you again at some point! Sorry it’s taken so long but here are some photos from my wedding last month. Would like to say a huge huge thank you to Charlotte at the Bridal Lounge Northallerton. If it hadn’t been for her fantastic advice I would never have had the amazing wedding dress I did. Great service and so helpful with everything. Thanks Charlotte. I recently got married on The 12th April at Winder Hall in Cumbria. I just wanted to say thank you for all the help and advice you gave me whilst choosing my Dress. I chose a Cymbeline Fema dress. It was perfect! The dress reflected my personality and looked amazing next to the grooms tweed suit! The layers when hooked up for dancing looked lovely and enabled me to dance the night away. Thank You for your professional and friendly advice, I was thrilled with my dress and didn’t want to take it off! I have enclosed some photos, you are welcome to use them if you wish. Thank you very much for all your help. I got a lot of fantastic comments on the dress especially with the black on it. My mum said you wanted some pictures of the back of it so I have attached a few for you to have a look at. At last a few photos from our wedding. The day was truly magical and exceeded all our expectations. Everybody commented how beautiful my dress was and one of the nicest they had ever seen, I really felt special. The bridesmaid dresses turned out ok too- phew!! Thankyou for doing such a great job. Your shop is the most professional I went into and you knowledge and expertise really shines through. Thanks so much for helping to make our wedding so special. Hi Charlotte. So the day is over with and I have had the whole day to enjoy photographs and reflect on the whole day. First of all I just wanted to say that your service was amazing and nothing was ever a problem for you and I felt so comfortable for my appointments. My wedding dress shopping horror turned into an fab experience so thank you so much. I will definitely call in for a natter and a laugh next year. I have a attached a picture for you and everybody said how lovely my dress was. I finally have access to some wedding pics! It was such an amazing day. The dress flew in style to South Africa. It ended up having its own first class seat while we sat in economy! Thanks for all your help in finding my perfect dress! Please find attached as promised. Will pop in the shop once back from honeymoon. I miss your visits to see you. Long time no see! 🙁 I miss our visits to see you. I know its been a while but here are the photographs as promised!!!! i would just like to say a really really big thank you to you as the dress was perfect and i felt truly beautiful in it, i kept it on till midnight even though i was sucking in my tummy holding in 4 course dinner and an evening buffet of bacon butties and chips, hoping that my organs would return to their original places once the dress was off…. but it was totally worth it. So i would like you to have a look through these photos noting the happy smiling bride and groom knowing that you had a huge part to play in making us both very happy on our wedding day! I just wanted to send you a note to say thank you for all your help finding me the perfect dress. The day itself was absolutely amazing and we enjoyed every minute. I’m sending through a couple of photos for you to have a look at. We are looking forward to getting the professional ones soon. As requested I am forwarding a few photos from Helen and Johnny’s wedding. We all had a fantastic day from start to finish. The sun shone and the dress looked absolutely perfect. It really seemed to have been made for Helen. She never stopped smiling all day! Thank you all so much for the time and care which you put in to help Helen to make her choice and to make the dress look so beautiful. We really did appreciate it. We also enjoyed every minute of all our appointments! Cathy Foster and Mrs Helen Ash. Thank you so much for all of your help and advice with my wedding dress and accessories. You were so knowledgable (pointing out things that I would never have considered!) and the whole team at Brides of York were very accommodating. I loved wearing the dress; it was really comfortable and I felt like a million dollars! Please also pass on my thanks to your colleagues. I have attached a few photos for you, please feel free to use for your web site etc. I appreciate all your help over the past few months my wedding dress is amazing and I felt very special in it. Wedding was perfect and everything ran smoothly. Please pass my thanks to your sister who was incredibly helpful and a huge thanks to you all. Please find attached to pics. I bought my dress from you and got married on July 12th. I have some photos of the dress I’d like to send you, they are absolutely amazing. What’s your email address please, I can’t find your card. As promised, I am sending some photo’s of me/dress and hubbie Mike for you all to see one of your brides in action but also for you to forward to Marguerite. I am sending photos through in separate emails because having problems sending, not sure if it is my end or your firewall, but hopefully one by one they will reach you! Thank you so much to you all for everything, I couldn’t have been happier with the dress and accessories and you were all an absolute delight to deal with. We had the most wonderful and memorable day, it really was perfect. I felt like a proper princess. Please also pass on my thanks to Marguerite. I absolutely loved my dress, I felt so special in it. I had so many compliments, my friends and family were just raving about how beautiful the dress was with many saying, quite genuinely, that it was the nicest or one of the nicest dresses they had seen. 2 of my friends want to get married again so they can borrow my dress! Most importantly, Mike thought it was perfect. He was pretty choked when he saw me appear at the bottom of the aisle in the church. And my Dad was also choked, very unusual for him! I loved the fact that although it was a big dress I was so free to move around. I just loved ‘floating’ around in it and didn’t want to sit down. Infact, we had an amazing band play during our evening do and we spent a big chunk of the evening dancing, it was amazing! Thanks again to you all for everything! Thanks again for everything, we had a perfect day and my dress was absolutely gorgeous, I couldn’t have felt any more special. I have attached some pictures of my beautiful dress from my wedding on 27th April. Everyone absolutely loved the dress – it was so easy to wear, exactly what I wanted – thank you!!! Just a quick email to say thank you so much for helping me choose my perfect dress. You made the whole process very stress free and enjoyable, which isn’t easy for me as I hate dress shopping! I had so many lovely compliments from everyone on the day. I have attached a photo of me and my gorgeous bridesmaids for you to see. You will be receiving a more formal thank you from myself and Craig very soon but I’ve been dying to contact you and take this opportunity to send you some pictures from our perfect wedding day. From the very start when I visited The Bridal Lounge in Northallerton you were first class in every way. My whole experience from the initial selection of my chosen gown, fittings and collecting has been fabulous; all down to the professional, experienced and friendly approach you gave, even down to the little extra personal touches which made my bridal gown feel extra special. I have also enjoyed a good giggle with you along the way. I will never forget your help and support throughout, which culminated in me feeling absolutely relaxed and stunning in my bridal gown on my wedding day, particularly when I saw Craig’s gasp and exclamation of, ‘Wow!’, when I walked down the grand staircase at Carlton Towers. I thought I’d send you some photos of our wedding day as promised. Thankyou so much for all of your help and also thankyou to all of your lovely staff too, all of the effort that you went to for me was very much appreciated. Our wedding day went very well, the weather was a little drizzly but nonetheless mainly dry, but only a handful of photos were able to be taken outside. In truth, I wasn’t very pleased with our photographer, she’s a lovely lady, but a few of the photos are out of focus & there are some really poor quality photographs. As promised I have attached a couple of photos for you of our big day. Thanks again for your help with the dress! Thank you for all of your help in the last year, you made the whole experience very memorable, my dress was amazing, I love it. Thank you so much for all your help and advice on choosing the right dress for my wedding day. Everyone commented on how stunning the dress looked and I felt like a princess all day which made our day even more special. I wouldn’t hesitate to recommend you to anyone you are a great assest to the Bridal Lounge in Northallerton. I really can’t thank you and your lovely ladies enough. You helped me find my perfect dress and every visit to Brides of York felt so special. What a wonderful team, a wonderful range and a wonderful service you have there. As promised, a few more pics of my dress “in action”! (The younger chap is my brother, who gave me away.). Are you able to pass these on to Marguerite? Or am I best to do that directly? She really is the most incredible artist. Attached are a few pictures of me and Al on the day of our wedding in Portmeirion, North Wales. I just wanted to thank you so much for all your help – from choosing a dress for me which I wouldn’t even have dreamt of myself, to completing ALL those alterations, most notably with that pesky halter-neck!!!! Everything came together perfectly on the day, and it was totally down to your hard work in the lead up to our big day!! I really can’t thank you enough!! I just wanted to say a big thank you for helping me to find the perfect dress for our big day! We had an absolutely amazing time and I felt like a princess in my beautiful Cymbelline dress. Thank you so much for ‘convincing’ me I could pull this dress off! I haven’t come across any pics with the front out yet as it was quite late & our photographer had left but if any guest have any I’ll forward on. I have finally gotten around to sending you a couple of photo’s from my Wedding Day (17th March 2012). My Sister hadn’t seen my dress prior to my wedding day but she loved it when she saw me in it for the first time. My Husband loved it too, as did other guests. Thank you for all your help, time & effort. North East Wedding Photography, Henry Aarvold. Here are some photos of me in my beautiful dress on 16th (and 17th) June. Thank you for all your work on it and your excellent service. I felt amazing in it and didn’t want to take it off! “Thank you to the girls at The Bridal Lounge Northallerton for my beautiful dress. I felt like a princess all day! Hi Charlotte, as promised I’ve attached a few wedding pictures. Thanks again for all your help and advice when choosing my dress. I felt very relaxed and found it a really enjoyable experience. I wouldn’t hesitate in recommending you. I can’t thank Brides of York enough for all their brilliant advice and guidance on selecting my dream wedding dress. They knew exactly what I was looking for and the overall look that I visualised right through to assisting me with every minor detail to make my dream a reality. Sharon, Charlotte and their team are so warm and friendly, every visit to their shop was special and I was always comfortable, relaxed and we had some real giggles too! My dress was so unique, utterly beautiful and exquisite and the comments I received all day were overwhelming.. I could not have asked for anything more.. Thank you so much Brides of York. I just wanted to say a big thank you for all your help and advice with my wedding dress and head piece. We had an excellent day couldn’t have asked for anything better and everybody commented on my wedding dress and how nice it was ( Even the husband was very impressed with the dress). I know you mentioned to bring some photo’s in of the dress if you have an email address that I can send some to I more than happy to if you wanted to see some. As promised, although slightly delayed, here is a selection of photographs from our wedding at Crathorne Hall in Feb. We really did both have a perfect day – as you’ll see we even managed to get outside for photographs! Peter loved my dress to… it brought tears to his eyes when he saw me – he says they were good tears as I looked so beautiful and not tears because he was just about to marry me! 🙂 I still didn’t get any tears from my mum or my sister but one of my bridesmaids (Charlotte) didn’t let me down and she blubbed!! I’m not sure if you’ll remember me, you must see hundreds of brides to be a year! But I promised you I would bring you a picture of my dress after our wedding and I still haven’t done it… so I came across your email address and thought I would get in touch. I’ve attached a picture of our day, my dress was an Augusta Jones dress, which was a cross between Catalina and Thomasina and the lovely designer made for me- which I am eternally grateful for as it was perfect! Everyone said what a wonderful dress it was, it really was a joy to wear and I’d like to say a proper thank you to you for all of your help in having it made, it was completely perfect and a day I will never forget, which has a lot to do with the fact that I felt amazing all day in my dress. Thanks again for making my wedding experience so much fun. If you ever need anyone to model the gowns – pick me! So much fun, I regret not trying on a massive meringue, although I would never have chosen it! My dress was perfect. I just wanted to say thank you to you both for all of your help and support leading up to the wedding. I have attached some photos of our wedding day showing mine and the bridesmaids gorgeous dresses! Everyone thought they were lovely and they seemed to glisten in the snow! We fell so lucky with the weather having gorgeous thick snow and no slush! I just wish we could do it all over again but it was the most perfect day and I wouldn’t change a thing! I will definitely be recommending you to my friends a few are getting married in 2012! You made me and the bridesmaids feel very comfortable and at ease everytime we visited – it was always a visit we looked forward to! I thought it was lovely having two people who were very honest in their opinion and not just trying to make a sale which is something we found visiting other dress shops! These are just a few of the photos we took last Saturday. The photographer was so taken with the dress and how beautiful Jenny looked in it that he offered to take more photos of her in it on her return from Honeymoon if she wished, for free!!! I thought you might also like to see the Groom’s outfit. We just wanted to say a huge thank you to you all for the support and help you gave us in choosing and fitting all of our dresses for Rachael and Oliver’s wedding last weekend, they all looked amazing!! We had a wonderful time, despite the weather! The bride and groom are off enjoying their honeymoon but Rachael wanted me to send you some photos, so hope you enjoy!